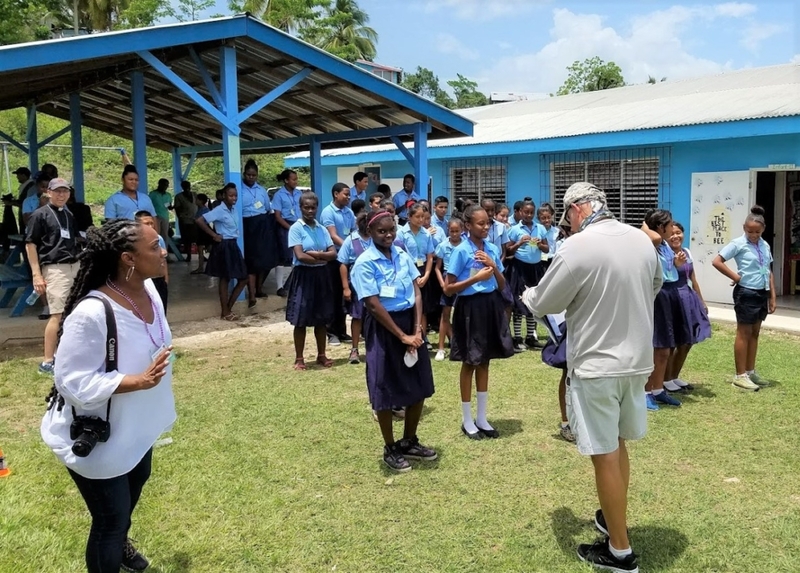 The Holy Sacrament Episcopal Church’s mission and outreach organization, Friends Reaching Friends, is currently engaged in missionary work in Belize. 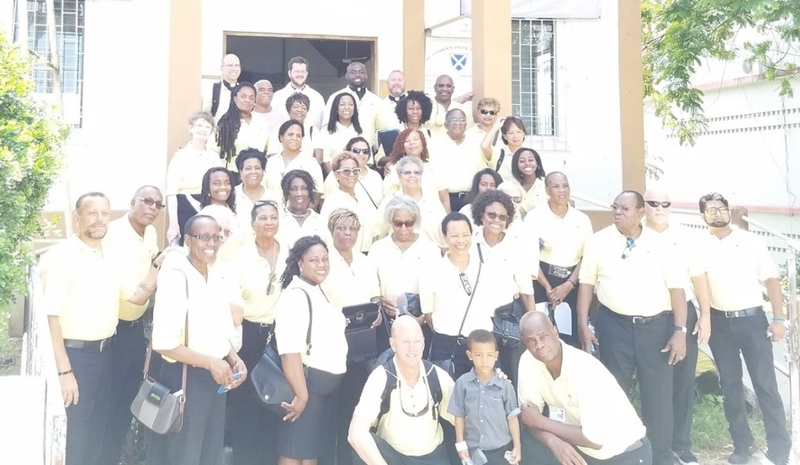 The 40-member group, led by Debbie Stevens, left the Miami International Airport on Saturday, June 10, for the Philip Goldson International Airport in Belize City. The team arrived safely after an hour and 40-minute flight, and was greeted at the Airport by Fr. 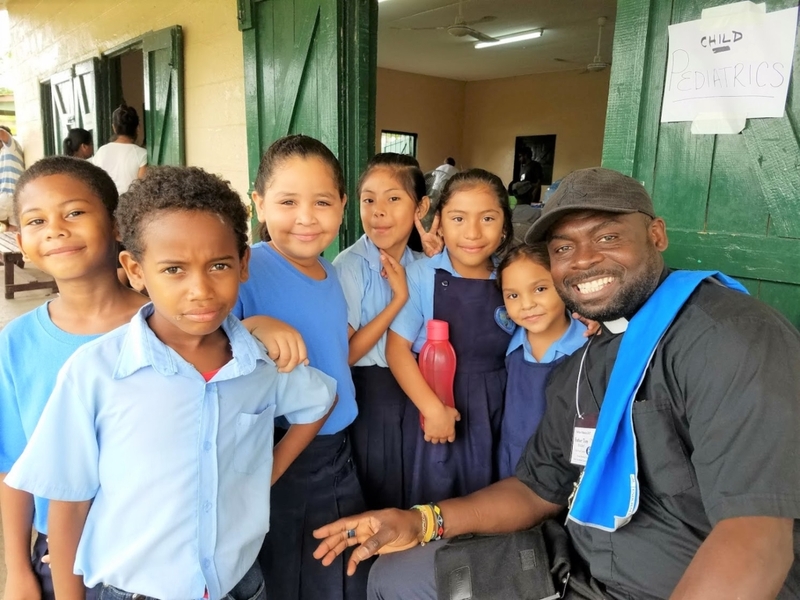 Eric Richards, a priest of the Anglican Diocese of Belize. We then traveled, by bus, for another two hours to the Cahal Pech Village Resort, San Ignacio, in the Cayo District. 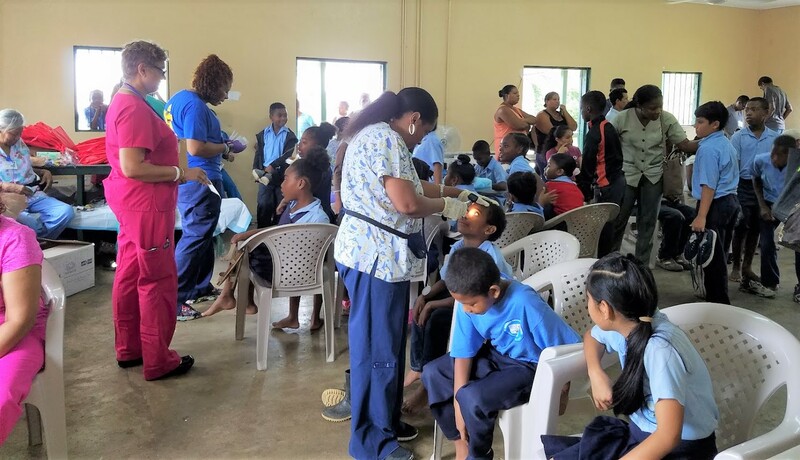 This is the first time that the team is ministering in the area, after working for the past three years in Belize City. The focus of ministry is in the two rural and beautiful communities of Georgeville and Central Farm. 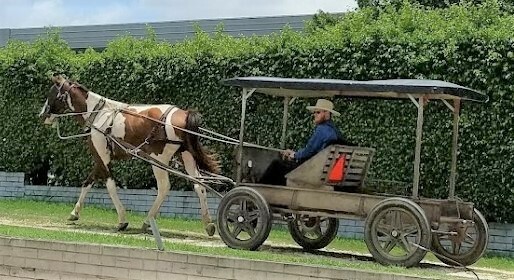 A Mennonite man riding in horse and buggy in the Spanish Lookout community. The Cayo District is situated on the western side of the country, bordering the country of Guatemala. I can see the hills of Guatemala from my hotel room. It is the second-most inhabited and the third-most densely populated of the six districts of Belize. 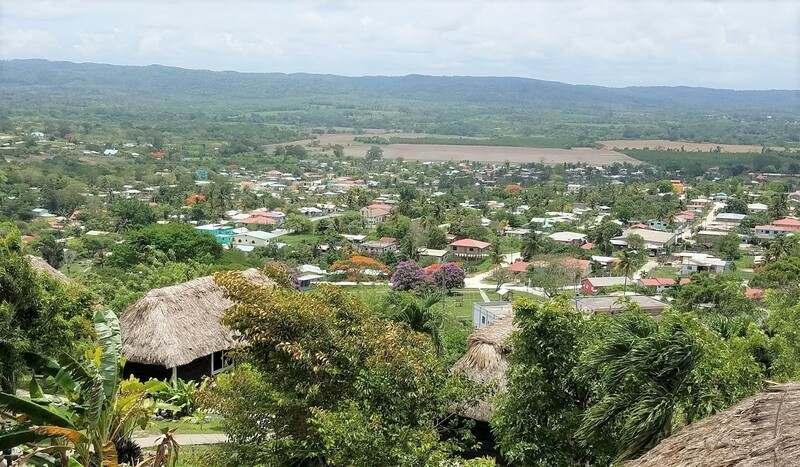 Although, the nation’s capital, Belmopan, is in the district, the capital of the Cayo District is the town of San Ignacio. The District is primarily agricultural, with citrus fruit, and more particularly, oranges, grapefruit, and tangerines, as well as bananas, being the main crops. Within the past few years, oil has been found and is being produced in the Spanish Lookout, a Mennonite settlement. Since our arrival, the mission has been eventful, with its challenges, while at the same time it has been very productive and successful thus far. The team attended Sunday Eucharist at St. Andrew’s Anglican Church, San Ignacio, where Fr. David Alenksis, is the Priest-in-Charge. As Spiritual Leader of the mission, I, along with the two Assistant Spiritual Leaders, Fr. Jon Robbins and Fr. Jeremy Froyen, have been leading the team each morning as we gather together for the Eucharist. Missionaries have been reading the lessons and the prayers of the people, and leading Compline in the night. We have been working diligently to accomplish a great amount of work in a short space of time. 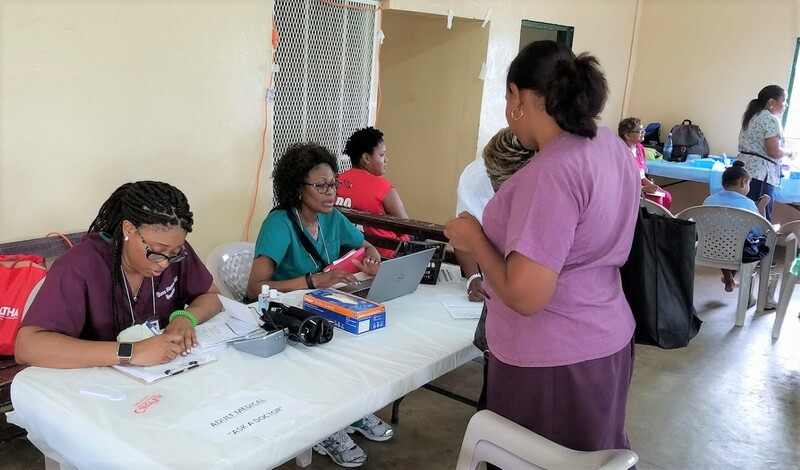 The Adult and Pediatric Health teams have, thus far, seen over 350 adults and children. The Health group includes two doctors, Dr. Patricia Rowe-King, and Dr. Tiona Stephens, 10 nurses and 10 other staff members. Adult Medical Leaders addressing a patient’s needs. We have found that many of the children are in reasonably good health but there are others that need greater care. Generally, adults in Belize suffer greatly from the hypertension and diabetes and this has been evident at the clinic. Construction guys in front of the restroom they are renovating at St. Barnabas School, Central Farm. 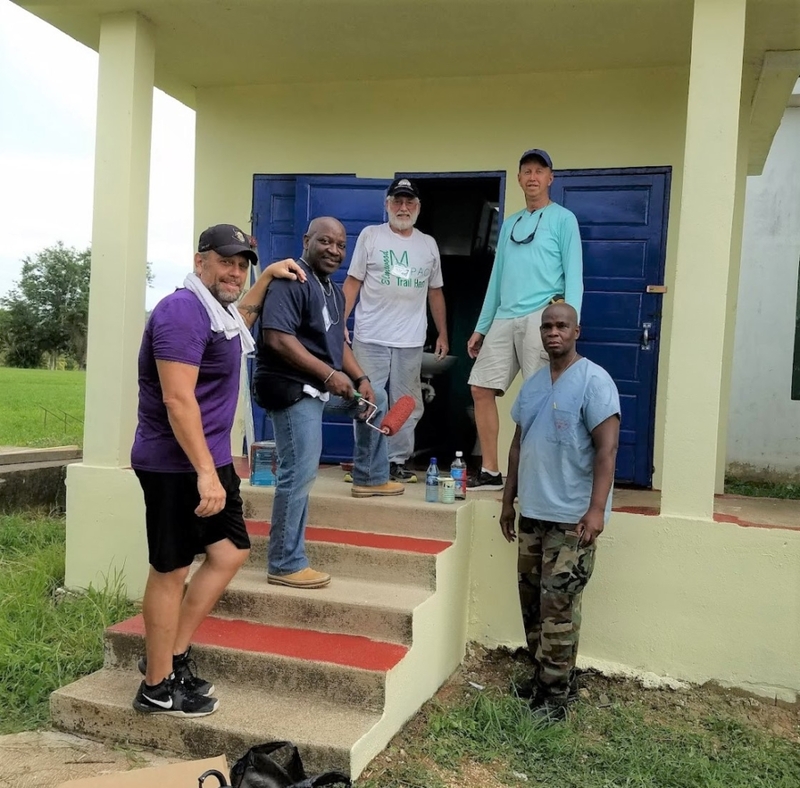 The Construction group of 6 men have been focusing their work on the St. Hilda’s Anglican School, in Georgeville, and St. Barnabas’ Anglican School, Central Farm. Restrooms are painted, water tanks, sinks, and floor tiles are being installed, and windows and doors are being repaired. Students completing their V.B.S. workbooks. Focusing on “The Armor of God” as its theme for the week, the Vacation Bible School (V.B.S.) is pressing ahead in giving Christian education, which is fun and at the same time they are learning to draw closer to God. Religious teaching, drawings, craft and games are the order of the day for sharing, educating, and implementing this theme. About 250 children, from both Anglican schools, are learning varying aspects of this theme by the 10-member V.B.S. team. 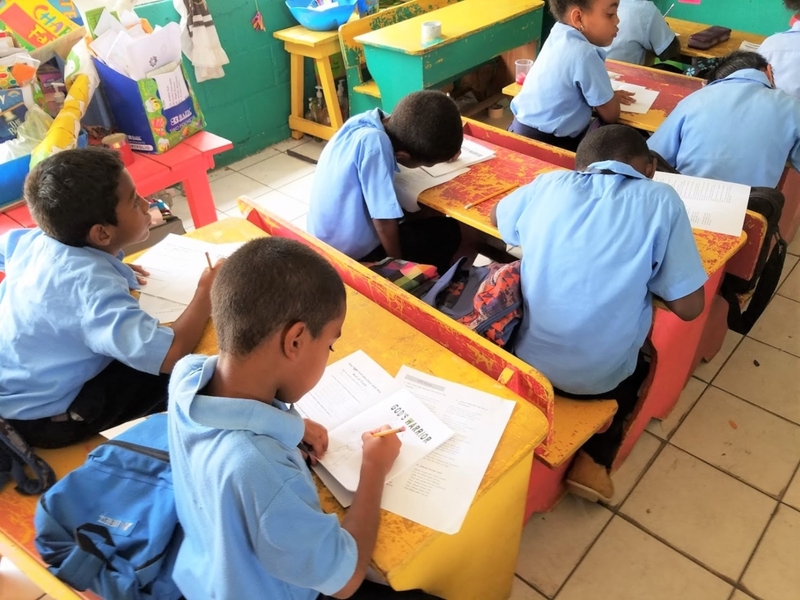 The children are so enthusiastic about the program, that some of them have chosen to continue during the lunch break to work on their projects. Our “resident” artist, Dr. Stephanie Young-Azan, is painting a mural on an outside wall at the St. Hilda’s Anglican School. It is shaping into a beautiful addition to the school and the Georgeville community. 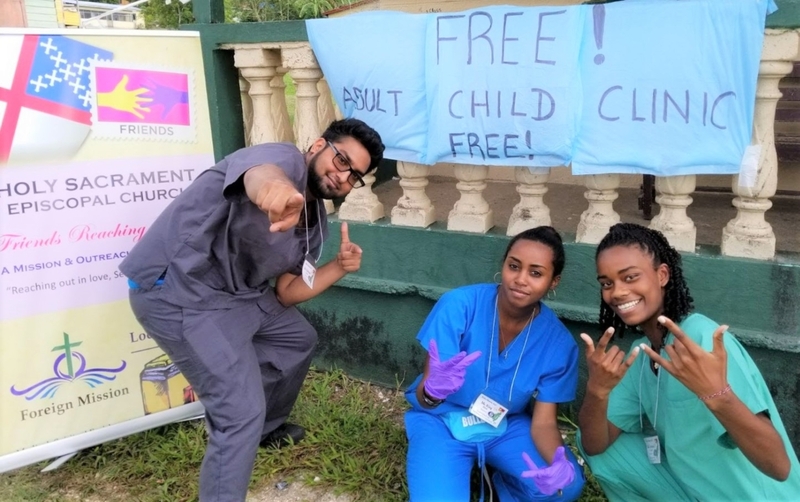 “The poster children for the mission” – Alim Rahman, Mya King and Coral Scotland. We are making a great impact on the lives of adults and children with eagerness and excitement…and are thankful to Almighty God for giving us the talents to serve Him and others. With some of the children outside the Medical Clinic at Georgeville Community Center. 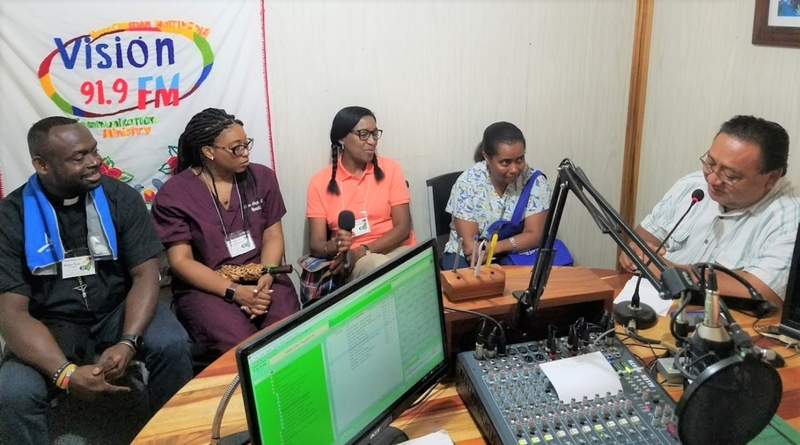 With part of the leadership team of the mission – (from left to right) – Dr. Tiona Stephens, Debbie Stevens, and Dr. Pat Rowe-King in a radio interview at Belize Vision 91.9 FM, a Spanish Christian Radio Station.